Seven Stories Press, 9781609800864, 208pp. 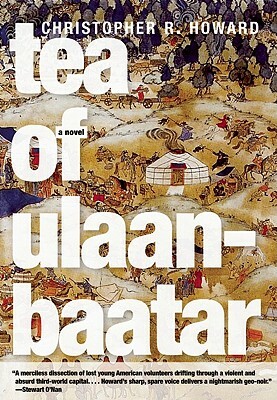 National Magazine Award finalist Christopher Howard's debut novel, Tea of Ulaanbaatar, tells the story of disaffected Peace Corps volunteer Warren, who flees life in late-capitalist America to find himself stationed in the post-Soviet industrial hell of urban Mongolia. As the American presence crumbles, Warren seeks escape in tsus, the mysterious "blood tea" that may be the final revenge of the defeated Khans—or that may be only a powerful hallucinogen operating on an uneasy mind—as a phantasmagoria of violence slowly envelops him. With prose that combines Benjamin Kunkel's satiric bite, William Burroughs’s dark historical reimagining, and a lush literary beauty all his own, Christopher Howard in Tea of Ulaanbaatar unfolds a story of expatriate angst, the dark side of globalization, and middle-class nightmares—and announces himself as one of the most inventive and ambitious of the new generation of American novelists. After an adolescence spent in Illinois and Missouri, Christopher Howard set off with the Peace Corps for Mongolia in the late 1990s, before returning home with a severe case of giardiasis. His short story "How to Make Millions in the Oil Market," published in McSweeney's and inspired by his time abroad, was nominated for the 2008 National Magazine Award in Fiction. Along with Jodi Picoult, he was one of two authors selected to provide a short story for the launch of Amazon Singles in January 2011. Howard lives in Illinois.